To push volumes of liquid around a water cooling loop, you'll need a pump. Unless you have a specific design in mind, it's usually best to go with a pump and reservoir combo unit, which — as the name suggests — has both a pump and reservoir in a single device. Solutions like the EKWB EK-XRES 140 Revo are what you should look at, bearing in mind flow rate, pricing, pump, and noise. Generally, you'll be okay with any pump you purchase for a small loop. This pump and reservoir combo from EKWB is a popular option for custom water cooling loops because of the reliable D5 pump and simple design, recently refreshed with optional RGB lighting. You've got PWM control, a pump rate at around 1,500 liters of liquid per hour, and it comes with full support for G1/4 fittings. Rocking the same D5 pump as the EKWB 140 Revo, this Thermaltake Pacific PR22 is a great unit with anti-vortex support for flow to enter in at the top. There aren't any fancy RGB LEDs, but you do get everything you need to set up a reliable and efficient water cooling loop with up to 1,135 liters of liquid moved per hour. When short on available space for a larger pump and reservoir, a combo unit like this one from EKWB is an ideal solution. It's compact and powerful, with PWM control to allow for automatic pump speed regulation depending on your CPU temperature. 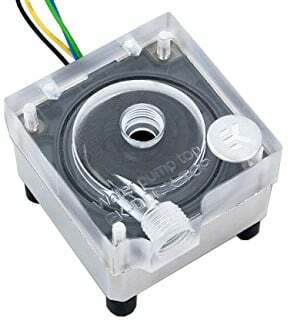 The pre-installed plexi top comes with two G1/4 threaded ports and the pump itself can handle up to 1,000 liters of liquid per hour. Whether you're just starting out with your first water cooling loop or have built a few PCs prior, the EKWB EK-XRES 140 Revo is one of the better reservoir and pump combo units available, packing the excellent D5 pump with handy features.